Born in Nisko ,Poland. Passionate artist graduated and started her art career at Piotr Michalowski School of Fine Arts and Design in Rzeszow, Poland in 1991. Received her diploma in Fine Applied Metal Arts under direction of Prof. Jan Bechta and Prof. Jan Madej. Studied sculpture in the studio of Prof. Piotr Kida, painting and drawing under direction of Prof. Jerzy Szymanski.Since 2002, Maria has been accepted into dozens of state wide juried shows and has won several dozen awards. Maria is a painter, sculptor and stained glass artist. She uses a very unique and unseen technique of composition on canvas or board by using all kinds of seeds, such as corn, bean, sesame, poppy and all other different grains. Maria transforms them into images of landscapes, floral compositions and portraits. All of the art has a strong visual presence and enable the spectator to plunge into exciting visual journey. Maria is also interested in photography which is often the first source and inspiration to her paintings. Nature is the main theme in her transformations and art. Her interesting and distinguished work attracts the attention of the connoisseurs and admirers. Her works are shown in various Polish and American galleries and institutions as well as in many private collections in Poland, France and United States. Mixed media art made of a natural material such as grain. 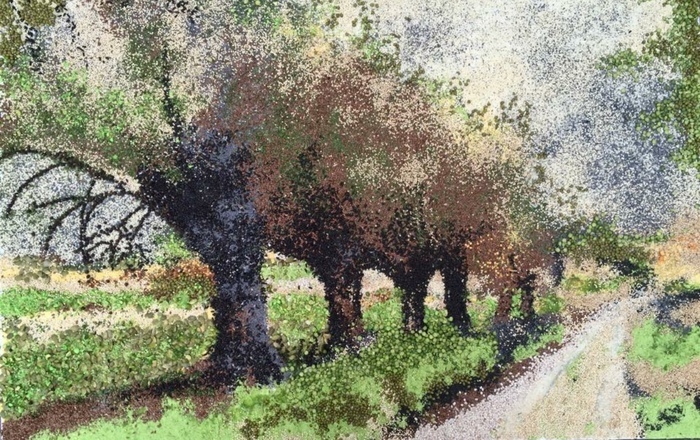 Unique technique with various seeds on canvas. Mixed Media Art grains on canvas.